The Airstream Basecamp is a simple travel trailer - designed for those who want features and convenience, but are willing to sacrifice some of the creature comforts. 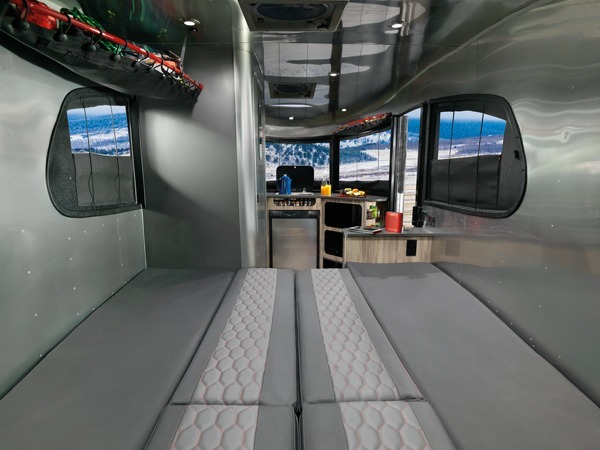 The bed in the Basecamp is a convertible dinette / bed, and the cushions normally used to sit and dine upon are repurposed into the mattress for the bed. The downside to this layout is that, without any modifications, the bed has some creases where the pillows come together, and it is a little stiffer than many people may be accustomed to sleeping on. The internet is full of solutions to make the bed more comfortable, and today I’ll share what worked well for us (along with a solution we didn’t like). Exped Megamat...high price, low comfort. Our first attempt to improve the sleeping conditions was to use the Exped MegaMat Duo Sleeping Pad, which is a high-end ($350!) air mattress that also uses foam to create a comfortable sleep. Conceptually this product is great, and when we tested it in our local REI, we thought it would be perfect. It didn’t have the normal squeaks and jiggles of an air mattress, and the memory foam built into it was soft and inviting. We purchased the double wide version, which was roughly the dimensions of a double bed. Unfortunately, while the Exped worked well outside the trailer, it was another matter inside the trailer. It is just a tad too long for the bed, and the extra corner material had to roll up awkwardly against the back door. And inflation took at least 10 minutes, which made the bed conversion process into a bit of a chore. It also didn’t offer a sleep as great as I thought it would. My husband, who weighs more than I do, would roll and I would wake up from being tossed around on the mattress as the air redistributed around. Furthermore, I woke both days with a really sore back, and the width of the mattress prohibited us from taking advantage of the full width of the bed itself (there was a several inch difference in widths between the underlying bed and the mattress on top). In the end, we returned the mattress and looked elsewhere. The new solution was to invest in a high quality pillow mattress topper. The exact one we purchased came from Bed, Bath & Beyond and is called the “Therapeutic Quilted Deluxe 3-in Memory Foam Bed Topper” (king sized). When laid across the bed of the airstream, it fits nearly perfect, with a little extra that naturally curls up the walls on the side of the bed. I would stress that it doesn't really matter which mattress topper you get... I didn't go into the store looking for this particular model. Instead, I looked for ones that felt comfortable and soft, but also rolled up compactly. There was no shortage of choices or price points to select from. We didn’t want to lay directly on the mattress pad; however, as that would be difficult to wash. So I went to IKEA and found a nice duvet cover for a king sized duvet. Wrapped inside, this functions like a pillowcase… and when we want to wash the sheets, we’ll remove the duvet cover and wash it just like we would a fitted sheet. This new solution is far more comfortable, allows us to take full advantage of the bed space, and - best of all - fits underneath the storage bench! And the Rest of the Bed? We use the original double (2 person) Rumpl Puffy Blanket for the top, which is perfectly sized and fits wonderfully. We also have some pillows that we purchased from IKEA that round out the rest of the bedding. Our fully built bed in the Basecamp.... welcome to a great night of sleep!